Back in college, I ripped out the backseats of my Honda Civic, threw down a plywood bed, and lived out of my car while I traveled around the country with my camera and a hundred rolls of Fuji Velvia film. Ever since then, I’ve always dreamed of upgrading to a big, sweet van, complete with a built-in bed and kitchen that would allow me and my family to travel around and have adventures. Well, we finally got that van. And instead of it being your standard RV conversion, we have converted a 2016 Mercedes-Benz 4×4 Sprinter Van into a one-ton grip truck/van that is equipped to handle any situation! Our ability to bring our small-footprint productions to virtually any domestic location just got more streamlined, more productive, and way more baller! As I’ve transitioned from shooting still photography to shooting video, I’ve quickly realized that one of the biggest changes is that you can no longer travel light. There is a LOT more gear associated with shooting video, from continuous lighting (LEDs and HMIs), to audio equipment, jibs, sliders, drones, tripods, fluid heads, carts, c-stands, gaff equipment, silks, duvies, speed rail, floppies, v-flats, shiny boards, extension cords, generators, and lots of other stuff! With this increase in equipment comes an efficiency issue. If you’re trying to find something, even as simple as gaff tape, and it’s buried in the back of your truck under hundreds of pounds of stands and tripods, there’s a real loss of productivity when you have to spend 20 minutes emptying out the bed of your truck just to grab that single item. And as many of you know, on a production every minute counts. All of this is a long way of saying that we finally reached that tipping point in our production in which it made sense to commit to building out a grip van that would allow us to streamline travel between productions, and be much more efficient and productive once we’re on location. As I was shopping around for Sprinter vans, I figured that a 2WD model would be adequate. 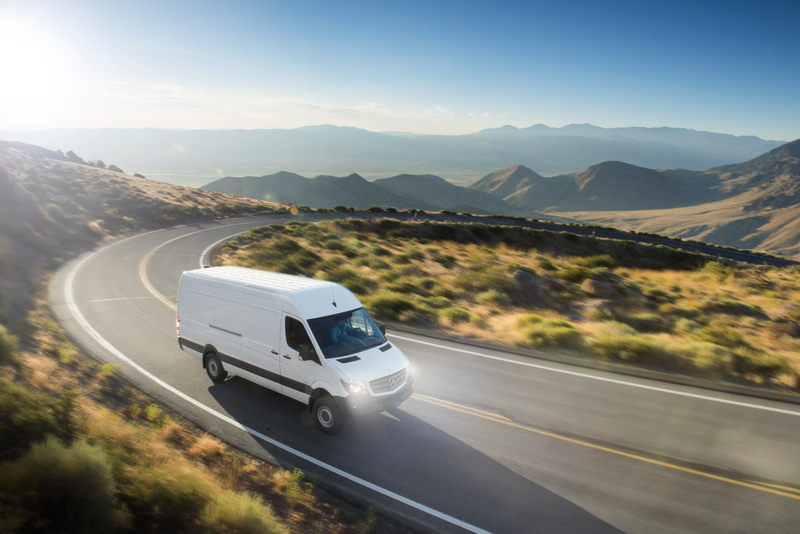 However, this year Mercedes-Benz released their 4WD Sprinter. I hemmed and hawed about going for the 4WD upgrade. Thankfully, our digital production artist and first assistant camera, Bligh Gillies, reminded me about all those 4 a.m. starts in the dead of winter in the Sierra Nevada mountains. Since we’re often chasing big storms to get fresh powder, having that extra bit of reliability is a smart and necessary upgrade. In fact, it has already paid off when, this past winter, we crushed the approach over a mountain pass with a foot of new snow on the ground! Our van’s interior is a custom build by Scott Gabler at his company, Bear Precision. We collaborated with Scott to design a storage system that would accommodate all of our equipment, and make it easy to access all while maximizing space. He did an amazing job, and it’s safe to say that this van has already changed our game! If you’re thinking about building out a van, Scotts you guy. You Need a Grip Van? We use our equipment all the time, but the reality is, if we’re not currently using it, I’d love to see one of my friends and colleagues put our equipment to good use. This will include renting our Sprinter van. If you’re ever coming to Tahoe for a production and need our custom 4×4 grip van shoot us an email or Facebook message for more details. Special Thanks to Bligh Gillies for the awesome photos of the van. Congratulations… looks like a nice layout, would love larger photos Googled Scott and his company with no luck. Any links available? Need to replace my aging Suburban. Bought new when my daughter was born, she just turned 23….